So you need a new air conditioning unit but are unsure of how to choose from all of the brands and products available out there. At Air on Demand, we’d like to help you out with part of that equation. Amana has been around since 1934, and this company continues to set the industry trends and develop the innovative technology used for comfort systems around the world. An Amana air conditioning system can bring you lasting comfort and reliability right in your own home or in a commercial setting. Discover your options in our brief primer on the Amana air conditioners available in Richmond Heights. When you choose from the Amana line of products, you can get a conventional air conditioning unit with an outdoor unit and choose from their line of quality indoor air handlers. These units provide superior comfort and efficiency, variable speed settings, and more. Ask your technician about Amana’s entry level ASX line of air conditioners for residential homes just starting out with a whole-home air conditioning system, or consider choosing from the ASXC line for the best in efficiency and performance Amana has to offer. Amana even has a line of high quality commercial units if you’re shopping for AC for a small or large commercial property. This includes packaged rooftop units which remain out of sight of clients, customers, employees, and tenants, while keeping the whole building conditioned to your needs. Furthermore, Amana offers their products in a wide range of efficiencies, with some units boasting a SEER greater than 18. The SEER (Seasonal Energy Efficiency Ratio) of a unit is displayed on any air conditioner sold in the U.S. A higher SEER means a more efficient system, which will amount to greater savings as time goes on. However, you can choose an Amana system with a lower SEER if the cost of installation is a concern. Air on Demand is proud to be a certified dealer of Amana air conditioners. Learn more about the benefits of these air conditioning systems, schedule repairs, or receive a thorough maintenance inspection by calling us today and asking about Amana air conditioners in Richmond Heights. *We now offer Air on Demand air conditioners to Richmond Heights and the surrounding areas. Call us today to learn more about our air conditioners and air conditioning services. An important part of how your air conditioner makes your home cool during the hot Florida summer is a chemical mixture known as refrigerant. As it gets circulated through your air conditioner’s coils, the refrigerant changes from a liquid to a gas inside the coils in order to cool the air as it passes over them. Up until fairly recently, CFCs (chlorofluorocarbons) were used in most air conditioning systems. When it became widely understood that the use of CFCs had ozone-depleting side-effects, many manufacturers switched over to more environmentally friendly refrigerants. 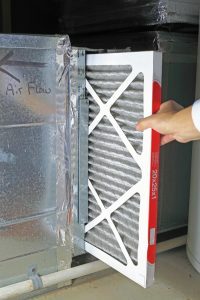 The US Environmental Protection Agency officially phased out the use of CFC-based refrigerant in 2010 for new systems. Nowadays, R-410A is the most common environmentally friendly refrigerant on the market. Being ozone-friendly requires a refrigerant that doesn’t use chlorine. Aside from the impact on the environment, switching to an eco-friendly refrigerant also reduces the risks of toxic chemical exposure in the event your refrigerant leaks. There are many alternatives on the market. To learn more about whether you can make the switch to a new refrigerant or new system, talk to the Miami, FL air conditioning experts at Air On Demand. If your air conditioner needs frequent repair is getting older, it may be more cost-effective to replace your unit rather than repair its broken components. Speak to a pro at Air On Demand today to understand what your air conditioning replacement and installation options are. Upgrading to a new environmentally friendly unit may not only help you save the environment, it may also reduce the amount of energy you use to cool your home.